Download "crowding out Crowding out at full employment"
2 2 natural rate). While tracing the effects of fiscal expansion at full employment is of limited empirical interest, except perhaps as a description of war efforts, it is useful for what follows. If labour supply is inelastic, output is fixed and any increase in aggregate demand must be offset by an increase in interest rates, leaving output unchanged. In the case of an increase in public spending, private spending will decrease; in the case of a decrease in income taxation, private spending will in the end be the same, but its composition will change as the share of interest sensitive components decreases. (If labour supply can vary, the story is more complicated. See, for example, Baxter and King, 1993, for an analysis of changes in government spending in an otherwise standard RBC model.) This is just the beginning of the story, however. Over time, changes in capital and debt lead to further effects on output. The decrease in investment in response to higher interest rates leads to a decline in capital accumulation and output, reducing the supply of goods. If fiscal expansion is associated with sustained deficits, the increase in debt further increases private wealth and private spending at given interest rates, further increasing interest rates and accelerating the decline in capital accumulation (see, for example, Blanchard, 1985, for a characterization of these dynamic effects in an economy with finite horizon consumers). How strong is this negative effect of debt on capital accumulation likely to be? One of the crucial links in this mechanism is the effect of government debt on interest rates; empirical evidence, both across countries and from the last two centuries, shows surprisingly little relation between the two. This probably reflects, however, more the difficulty of identifying and controlling for other factors than the absence of an effect of debt and deficits on interest rates. Worse can happen. It may be that the fiscal programme becomes unsustainable. There is no reason to worry about a fiscal programme in which debt grows temporarily faster than the interest rate. But there is reason to worry when there is a positive probability that, even under the most optimistic assumptions, debt will have to grow for ever faster than the interest rate. When this is the case, it implies that the government can meet its interest payments on existing debt only by borrowing more and more. What happens then may depend on the circumstances. Bond holders may start anticipating repudiation of government debt and require a risk premium on the debt, further accelerating deficits and the growth of the debt. If they instead anticipate repudiation through inflation, they will require a higher nominal rate and compensation for inflation risk in the form of a premium on all nominal debt, private and public. What is sure is that there will be increased uncertainty in financial markets and that this will further contribute to decreases in output and in welfare. The historical record suggests that it takes very large deficits and debt levels before the market perceives them as potentially unsustainable. England was able in the 19th century to build debt-to-gdp ratios close to 200 per cent without apparent trouble. Some European countries are currently running high deficits while already having debt-to-gdp ratios in excess of 100 per cent, without any evidence of a risk premium on government debt. The threshold seems lower for Latin American economies. But even if one excludes this worst-case scenario, fiscal expansion can clearly have adverse effects on output at full employment. The relevant issue, however, is whether the same dangers are present when fiscal expansion is implemented to reduce unemployment, which is presumably when it is most likely to be used. 4 4 are very bad, and the fiscal consolidation is large and credible, the net effect of consolidation may be expansionary (Giavazzi and Pagano, 1990). Crowding out: an assessment Should one conclude from this that fiscal policy is an unreliable macroeconomic tool, with small and sometimes negative effects on output? The answer is no. Fiscal Policy is likely to partly crowd out some components of private spending, even in the best circumstances, but there is little reason to doubt that it can help the economy return to full employment. 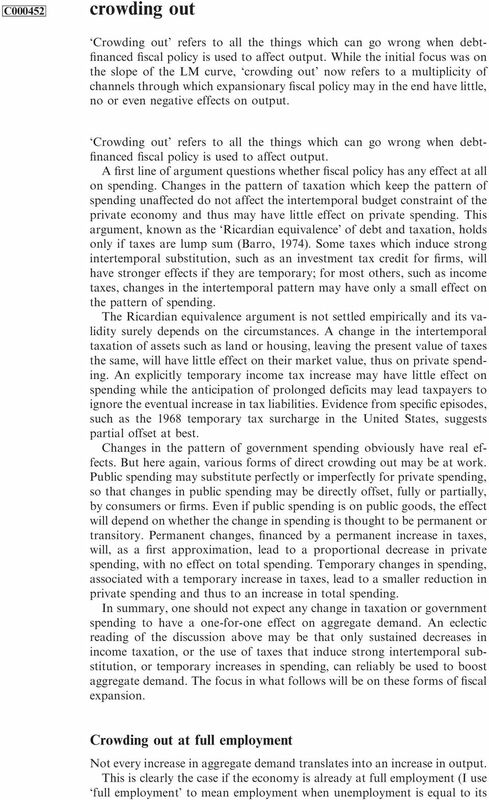 Ricardian equivalence and direct warn us that not any tax cut or spending increase will increase aggregate demand. But there is little question that temporary spending or sustained income tax cuts will do so. Results of full at less than full employment, such as the Mundell Fleming result, are simply a reminder that the monetary-fiscal policy mix is important. In all cases, monetary accommodation of the increased demand for money removes the negative or the zero multipliers. That fiscal expansion affects capital accumulation, and output adversely at full employment, and that unsustainable fiscal programmes may lead to crises of confidence, is a reminder that fiscal expansion should not be synonymous with steady increases in the debt-to-gdp ratio even after the economy has returned to full employment. This shows one of the difficulties associated with fiscal expansion: if done through tax cuts, it has to be expected to last long enough to affect private spending, but not so long as to lead to expectations of runaway deficits in the long run. The room for manoeuvre is, however, substantial. Some taxes, such as the investment tax credit, work best when temporary. These can be used, as they work in the short run and have few adverse implications for the long run. Olivier J. Blanchard See also <xref=xyyyyyy> budget deficits; <xref=r000047> real business cycles; <xref=xyyyyyy> Ricardian equivalence theorem; <xref=t000069> Tobin, James. Bibliography Barro, R Are government bonds net wealth? 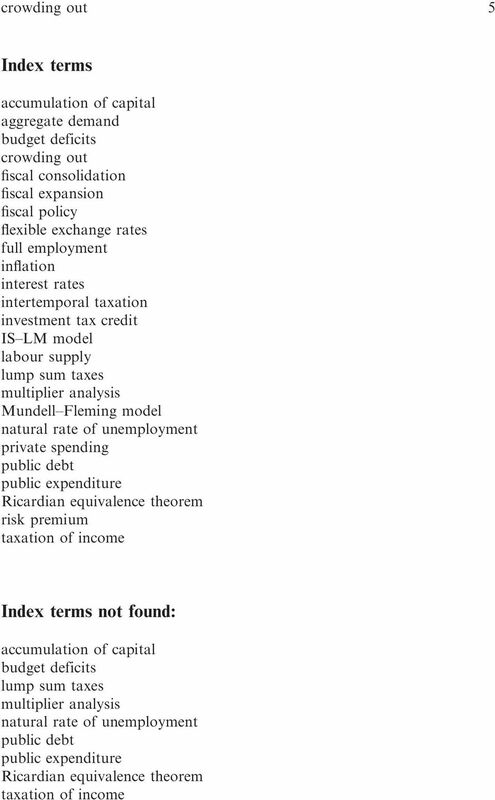 Journal of Political Economy 82, Baxter, M. and King, R Fiscal Policy in general equilibrium. American Economic Review 83, Blanchard, O Debt, deficits, and finite horizons. Journal of Political Economy 93, Giavazzi, F. and Pagano, M Can severe fiscal contractions be expansionary? NBER Macroeconomics Annual 5, Tobin, J. and Buiter, W Long-run effects of fiscal and monetary policy on aggregate demand. In Monetarism, ed. J. Stein. Amsterdam: North-Holland.
. In this case the leakage effect of tax increases is mitigated because some of the reduction in disposable income would have otherwise been saved. Chapter 1: Government Debt Indebtedness of the world s governments Country Gov Debt (% of GDP) Country Gov Debt (% of GDP) Japan 17 U.K. 9 Italy 11 Netherlands Greece 11 Norway Belgium 9 Sweden U.S.A.
Macroeconomics, 6e (Abel et al.) Chapter 4 Consumption, Saving, and Investment 4.1 Consumption and Saving 1) Desired national saving equals A) Y - C d - G. B) C d + I d + G. C) I d + G. D) Y - I d - G.
Please write answers in ink. You may use a pencil to draw your graphs. Good luck. 120 points. 15 points each. Allocate your time efficiently. 10. When monetary policy becomes ineffective: liquidity traps.